The Amplicomms TLC 410 Extra-Loud Alarm Clock with Vibrating Pillow Pad combines an adjustable volume of over 95dB with a large display screen for optimal use by people with audial or visual impairments. With an included Vibrating Pillow Pad for improved alert. it is ideal for use around the home, and will also be practical for use in noisy working environments. To ensure that the alarm can be heard clearly when it sounds, the volume can be continually adjusted to above 95dB. This makes it ideal for anybody with reduced hearing abilities, as it can be altered to a level that best suits the individual. 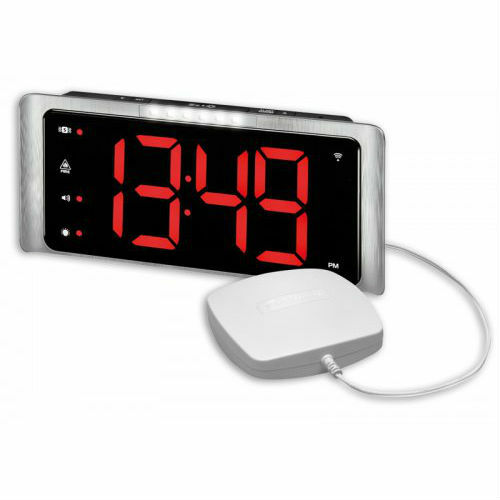 Not only does this mean it can be used around the home with improved convenience, but it is also suitable for noisy working environments where timers may need to be set. This will help to ensure that tasks do not overrun, which could be crucial in such environments with machinery or noisy equipment. With a large display screen, the digits are easy to read. They are displayed as three-inch red LED numbers to ensure that the time can be received at a glance. This will not only save time by providing a display that can be read from across the room, but it will also be of significant benefit to anybody with reduced eyesight. The screen also features three dimming levels. 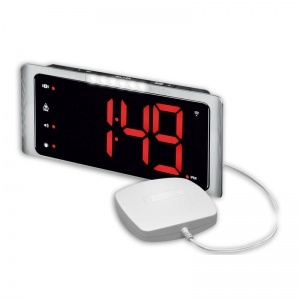 This will be particularly useful for anybody with sensitive eyesight who does not wish to look at an overly bright screen but who would still wish to benefit from the enhanced alert volume provided by the TLC 410 Alarm Clock. In situations where it may be impossible to hear an alert, whether due to hearing loss or the use of protective ear muffs blocking out external sounds, the clock also emits six extra-bright flashing lights. They can catch the attention with the bright light signal to indicate when the clock is sounding, thus combining both audio and visual properties to provide an alert system that will be ideal for most.